The Order of the Crown (French: Ordre de la Couronne, Dutch: Kroonorde) is a national order of the Kingdom of Belgium. The Order is one of Belgium's highest honors. The Order was established on October 15, 1897 by King Leopold II in his capacity as ruler of the Congo Free State. The order was first intended to recognize heroic deeds and distinguished service achieved for service in the Congo Free State—many of which acts soon became highly controversial. In 1908, the Order of the Crown was made a national honour of Belgium, junior to the Order of Leopold. Currently, the Order of the Crown is awarded for services rendered to the Belgian state, especially for meritorious service in public employment. The Order of the Crown is also awarded for distinguished artistic, literary or scientific achievements, or for commercial or industrial services in Belgium or Africa. The Order may also be bestowed to foreign nationals and is frequently awarded to military and diplomatic personnel of other countries stationed in (or providing support to) Belgium. During the Second World War, the Order of the Crown was extensively authorized for award to Allied military personnel who had helped to liberate Belgium from the occupation forces of Nazi Germany. The Order of the Crown is awarded by royal decree. The badge of the Order is a white-enamelled Maltese cross with straight rays, in silver for the Knight class and in gold for the higher classes. The obverse central disc has a gold crown on a blue enamelled background; the reverse central disc has the face-to-face monogram "L" (for King Leopold II) on a blue enamelled background. The badge is suspended from a green-enamelled wreath of laurel and oak leaves. The medal is round in gold, silver and bronze versions, with a suspension in the form of a royal crown with two pendelia and a ribbon ring. The obverse shows a finely ribbed central area with bead surround, with the royal crown superimposed. The surrounding circlet carries the motto of the Belgian Congo: Travail et Progrès (work and progress) —the later issues are bilingual including the Dutch Arbeid en Vooruitgang in the lower half of the circlet. The reverse is a stylised 'double L' crowned Leopold II monogram within a palm wreath. Stars, palms, borders or stripes can be awarded together, but these deviations are currently only rarely awarded. The ribbon of the palms and medals has a vertical white border on both sides as well as a metal pin showing a reduction of the palm or medal. Despite the fact that, in contrast to the Order of Leopold, no maritime division of the Order of the Crown exists, some unofficial decorations with crossed anchors under the wreath are known to exist. National orders are awarded by royal decree at fixed dates: 8 April (birthday of King Albert I), 15 November (King's Feast), and in some cases on 21 July (Belgian national holiday) to reward meritorious services to the Kingdom of Belgium based on the career path and age of the recipient. A number of different regulations rule the award of national orders for the various ministries. In addition, the national orders may be awarded by the king for especially meritorious deeds. The royal decrees are published in the Belgian official journal, Moniteur Belge. For people who are not Belgian, honours are not published in the Moniteur and bestowed all year round by the foreign office. Recent example is the Grand Cross of ambassador Vershbow. The ministry responsible for foreign affairs, currently the Federal Public Service (SPF/FOD) Foreign Affairs, administers the national orders and the minister has the role of advisor in cases not fitting within a regulation. For the award of national orders for persons to whom no regulation applies or has been adopted, the number of awards is limited every year by decision of the Council of Ministers (contingent). Silver Palms: Awarded after 30 years of meritorious service for a private or corporal. The palms and the medals of the Order of the Crown may be awarded to workers in the private sector or contractual employees of the public sector, as well as some public sector employees such as prison supervisors, ushers, burgomasters, police commissioners, local police officers, or members of town councils. Gold Medal: Awarded after 35 years of professional activity. In addition, the Gold Medal, the Silver Palms and the Golden Palms are awarded to the presidents, secretaries and members of the board of directors of representative trade organisations such as trade unions on the basis of the number of members of the organisation, of the length of their membership of the board, and on the length of their tenure on the board. The Knight's Cross of the Order of the Crown is also awarded to the members of the national and provincial committees for the promotion of labour who have reached the age of 42 after a tenure of 10 years (national committee) or 20 years (provincial committee) and, after 30 years of service, to the secretaries of the provincial committees for the promotion of labour who have reached the age of 62. The medal could also be awarded without the rigid 'time in service' criteria to administrators, directors, department heads, artisans, architects, chemists, specialist craftsmen, etc., each case for an award assessed on an individual basis. The bronze medal appears to have been confined mainly to the Caucasian workers of the Belgian Congo or Congo Free State for 11 years service, apart from a period—duration unknown—when it was also used in Belgium to reward firemen and rural guards for 40 years' service. Even though orders from different States are not always easy to compare, the Order of the Crown is roughly equivalent to the following orders from other States. The British Order of the British Empire, which has similar classes, but with the difference that award of the Order of the Crown does not confer knighthood. 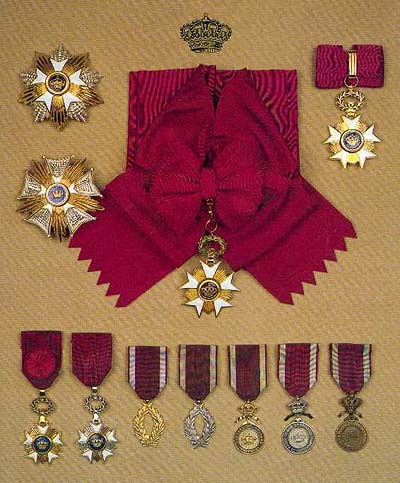 The French Ordre National du Mérite, which is the second highest French order and has similar classes and award conditions. The Luxembourg Order of the Oak Crown, which is the third highest Luxembourgian order and has similar classes. The Dutch Order of Orange-Nassau, which is the third Dutch national order and has similar classes. The Royal Norwegian Order of Merit, which is currently the second highest Norwegian order and has similar classes. The Swedish Order of Vasa, which is the second highest Swedish order awarded more widely than to Heads of State and has similar classes. Prior to 1975, the Swedish Order of the Polar Star would be equivalent to the Order of the Crown instead. ^ NATO Deputy Secretary General receives prestigious Order of the Crown, NATO (September 27, 2016). ^ "J'ai remis la décoration de Grand Croix de l'Ordre de la Couronne à l'Ambassadeur Vershbow". Didier Reynders. ^ ""MARTIN, Major-Gen. James Fitzgerald." In Who Was Who, A & C Black, an imprint of Bloomsbury Publishing, London 1920–2016. Who Was Who, Online Edition, Oxford University Press, April 2014".